See what I mean? How could one possibly write a serious story about these people and places? Wodehouse is quite the witty word engineer. The plot of this story revolves around Ginger Winship’s run for the House of Commons. Ginger is one of Bertie’s old college chums, so Bertie agrees to travel to Market Snodsbury to canvass the town’s inhabitants in hopes of helping Ginger win the election. While in Market Snodsbury, Bertie and Jeeves stay at the home of Bertie’s Aunt Dahlia, which is quite the happening place. What ensues is a comedy of errors involving (but certainly, certainly not limited to!) a wealthy businesss man who stole a patent from one of his employees, from whom Aunt Dahlia is determined to wring some restitutionary payment since the son of the now-deceased employee happens to be the fiancée of her daughter. (Clear as mud?) Of course, there’s also the matter of a certain notebook, property of the Junior Ganymede, which contains all the fits and foibles of London’s elite, as observed and recorded by their butlers. This notebook has been “pinched,” and its existence threatens to wreak havoc on Ginger’s campaign and his love-life, not to mention potentially the lives of many other a fine gentleman. And then there’s the fact that Ginger’s fiancée (and the moving force behind his run for Parliament) is none other than Florence Craye, former intended of Bertie. My head fairly spun with all the comings and goings of the characters and all of the switching and swapping of love interests. It is pure, absurd fun. a tongue-in-cheek approach to romance and marriage, or at least romance and marriage for Bertie. His near miss with Florence Craye is legendary, and by the end of the story yet another girl has declared her intentions toward him. When that falls through, he says that he “would send camels bearing apes, ivory and peacocks” to the address of the person who “saved [him] from a fate worse than death,” marriage to one Madeline Bassett. lots of stealing or “pinching” of items. Much of the humor in the stories depends on something being swiped and then Bertie (and therefore, Jeeves) having to get the stolen items back into the room of its owner before its absence is noticed. some physical humor. Bertie sometimes finds himself hiding uncomfortably in the bushes to eavesdrop on a conversation, etc. Many years ago in our pre-parenthood days, Steady Eddie and I attended a fantastic performance of Oscar Wilde’s The Importance of Being Earnest at the Alabama Shakespeare Festival. That and the movie Arsenic and Old Lace are what came to mind while I was reading Jeeves and the Tie That Binds. Although I was often a little fuzzy on who now is engaged to whom and in whose possession the pinched porringer (or the pinched notebook) currently resides, I thoroughly enjoyed this story. 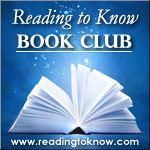 I am so happy to add my review to Carrie’s list of links for April’s Reading to Know Book Club. 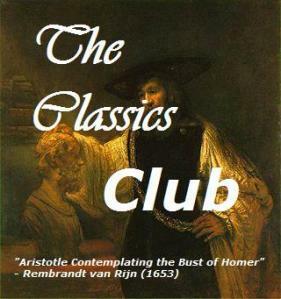 This is also the first book I can mark off my list for The Classics Club. Hey! Two for the price of one! That’s awesome! I’m so glad you read along and met Wodehouse this month. I don’t think I’ve read this particular title. Laughing over the one-liners you shared. He’s got great one-liners. I do love the one liners! I’m glad you shared all those excerpts. Jeeves and Wooster are such a pleasure!